You’ve hit a good drive into the middle of the fairway, the ball is sitting nicely on a lush piece of turf and in your mind’s eye you can easily picture the ball cutting through the air and landing softly on a green that is begging to be hit. And then you hit a fat shot! 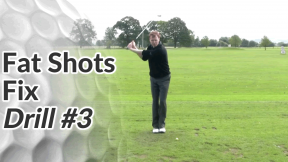 The ball travels all of 20 yards – often less than the divot you took along with it! Fat shots are frustrating and can knock your confidence. 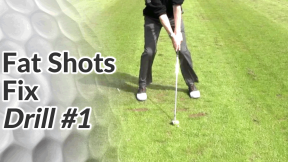 The fat shot drills in this section will help you to eradicate fat or heavy shots from your golf game for good. Not all fat shots are as obvious as taking a huge chunk of turf a good 6 inches before the ball. In fact, you might be hitting the ball a bit fat or heavy on a regular basis without even knowing it (a lot of amateur players do). If this is the case you’re losing both power and control over the ball flight. Don’t be afraid to take a divot – it’s part of creating a solid, powerful strike. However, the divot you take must be after the golf ball – not in front and not even directly beneath it – but immediately after where the ball is resting. Try the exercise in this video next time you’re at the range. Notice where you take the majority of your divots (if you take them at all). 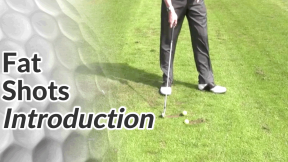 The first step is to make a conscious effort to take a divot immediately after the ball with each swing. 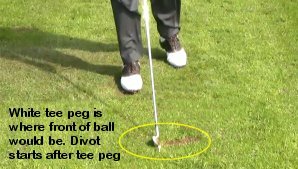 You don’t even need to hit golf balls to do this – simply place a tee peg in the ground, just outside the line of the club’s path, opposite to where the front edge of the ball would be.